Master of Design | Keynote Evgeny Morozov: The ‘Smart City’ as a transition point towards the ‘Private City’. Keynote Evgeny Morozov: The ‘Smart City’ as a transition point towards the ‘Private City’. Erasmus Pavilion, Erasmus University, Rotterdam. The ‘Smart City’ as a transition point towards the ‘Private City’. Judged by the views he displays in his books, publications and and twitterfeed, Evgeny Morozov is not the type of keynote speaker that will have you leave his lectures in a cheerful mood. Morozov tends to sketch a rather bleak image of the future, where Neoliberalism and Venture Capitalism will have become the status quo and large private companies will have a firm grip on our individual lives by providing technology that, while we use it, extracts our personal data in order to nudge our behaviour and coerce us in doing what is right in their minds. 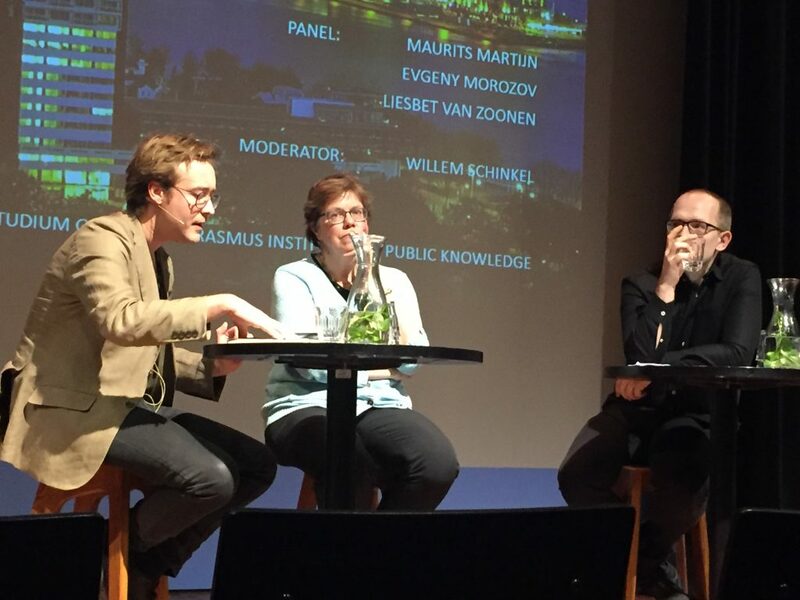 As part of the Erasmus University ‘Studium Generale’; Evgeny Morozov was invited to reflect on the current state of affairs concerning the development of so called ‘Smart Cities’. As I am currently in the midst of compiling my research thesis on the role of interface design in the discourse of privacy and contextual integrity, I decided to attend this lecture. In 2015, I was captivated by Morozov’s sharp, uncompromising observations on technology, society and politics. In his book, ‘To save everything, click here (2013)’ he criticizes the functionalistic approach towards smart artefacts (ie. networked devices). In other words: technology as functionalistic means to make life easier, effortless. If technology is applied just to ‘solve some genuine social need “out there”’ (Morozov, 2013) it does not address the source of that need nor does it encourage reflection on that source. That in itself is what is wrong with our deterministic approach to technology these days. In a short introduction, Morozov explains that he is currently working on a new book: “Freedom as a service”, which actually is a product statement / payoff by Cisco Systems. He reflects on the fact that “Freedom is no longer a right, but a service provided by companies”. 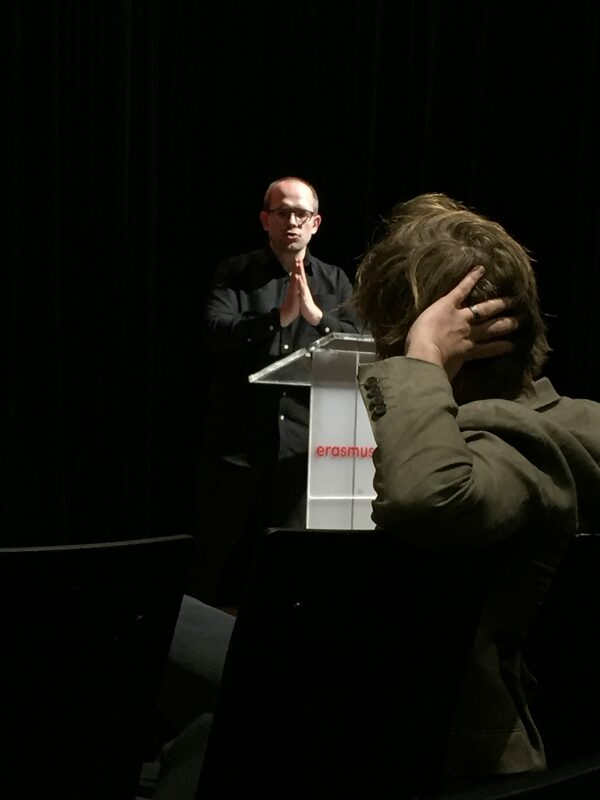 With his statement Morozov frames his views on the current state of affairs regarding the efforts of governments and especially corporations to make cities, or urban areas, ‘smart’. By ‘Smart Cities’ he immediately makes the distinction between the application of actual smart infrastructure, such as sensored artefacts or smart artefacts/infrastructure, and the way companies as Uber, Airbnb and other ‘shared economy’-concepts provide virtual infrastructure through computers and handhelds that actually enforces new socio-economic structures within a city. Morozov uses the Google Sidewalk lab as an example of Google’s efforts to tap into these developments. What he finds worth noting, is that Sidewalk Lab’s current CEO, Daniel L. Doctoroff, is an ex-Bloomberg CEO and former vice mayor of New York Economic Development and Rebuilding. So, according to Morozov, this shows Silicon Valley is trying to combine technology, venture capitalism and politics to develop private services for urban areas. While Google itself has had data extraction as a primary business goal for a long time, this data is particularly useful for their urban area ventures: traffic monitoring, public transport, even social services. So the fact is, these companies already have enormous amounts of data on the inhabitants of cities, which in turn gives them a huge amount of leverage. Morozov argues that data may well be used as a bargaining chip by these companies when it comes to conflicting interests between Big Tech and local legislation. Uber already has a data sharing deal with the city of Boston, and could (and probably will) use this deal as leverage to gain influence in legislation or future partnerships. Morozov sketches a gloomy picture of smart cities currently in development in countries as India, where foreign companies and investors create technology-laden campuses and new urban development areas that try to lure new foreign investments. The smart city agenda in these countries is particularly political, but the question here is: who controls the data that is produced in these cities, and in the end, who owns these services that use these data? Smart cities tend to hide more data than they reveal, and to most civilians, the socio-economic and political interests behind the smart infrastructures are often opaque at least and completely hidden at worst. Morozov sees a trend, especially regarding cities that have trouble providing proper infrastructure, public transport and social services due to austerity measures. Besides, the companies following shared economy concepts, such as AirBnb, promise that people can make money through their own assets, by “turning their homes into an ATM”. By providing their services, tech companies provide alternatives to governments that have their hands tied by shrinking budgets, and these companies and their investors see these cities as new opportunities for investments. So, by using this extracted data as a bargaining chip, these companies try to create foothold in cities and eventually, all social services will become privatized. Morozov fears a future where social services, legislation and even law enforcement will increasingly be transferred to private companies. Referring to the Chinese social credit system, he argues these companies will use harvested data to nudge and coerce inhabitants of these smart cities to behave according to the guidelines these companies will create. Morozov coins terms as “Singaporisation” or “Privatized Keynesianism”, when it comes to these structures. By constructing a market that has a high demand for private solutions because of austerity measures in the public sector, private (tech) companies will take a leading role in providing public services. Because these services then are completely dependent on the (smart) infrastructure of these companies, governments will probably be permanently tied to these companies. Evenmore, these companies will demand influence in legislation and enforcement. This in turn has a great deal of influence on political structure; where regime change will be deemed unfavorable. Hence, a comfortable, hi-tech rich city with a high level of monitoring on its civilians and a strong enforcement: Singapore. So, is this really the direction we are heading in? How can we ensure our political systems are not susceptible to adaptation to these corporate agendas? How can we safeguard public services in such a way privatisation does not mean we hand over our autonomy and freedom of choice? Could these services be designed in such a way there will be less of a monopoly for big tech firms? Morozov sees possibilities in decentralised data solutions, such as Blockchains. If civilians / urban inhabitants have more control and autonomy when it comes to the use of their personal data, these companies have less leverage. Arguments aside, Morozov provides realistic insights into the dynamics of the business models that drive the quest for ‘Smart Cities’. The term itself is misleading; coined by tech companies, not by the inhabitants of these cities. To speak of real smart cities, there would need to be a balance between ethical and distributed deployment of technology and the use of decentralised data. Only when inhabitants remain free to make their own choices, based upon data dat is freely available and not being monitored by and channeled through venture capitalist tech companies, we can truly speak of a smart city.